I want to start off by saying, I am so proud of our students here at Rio. You’ll understand why as you read through this. 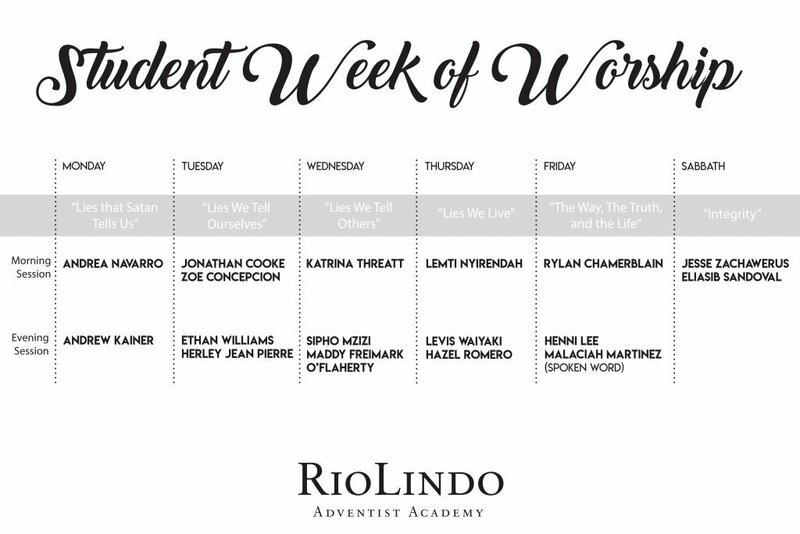 During the week of April 9-14, we had our Student Week of Worship (SWOW). 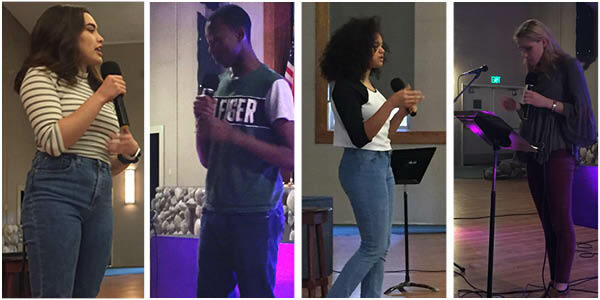 It is a week where we have student speakers give short sermonettes. We had sessions where we had students speakers in the morning and the evening. In our evening programs, we had our Music Ministry band lead out in worship through song. They introduced two new songs, “Vapor” and “Reckless Love”. As a side note, the Music Ministry band has been working hard all school year to help lead worship for our vespers programs and for church. They have been doing a fabulous job sharing their love of music and worship. Our Campus Ministries department value having engagement and response during our programing. We empower our students to give their thoughts about deeper messages and meaning. In order for us to accomplish this desire of engagement and deeper meaning, in our evening session we have our students break up into small groups with their Home Groups. During this time, students share their thoughts about the topic and answer discussion questions with their small group. We invited faculty to also participate in discussion with the students to help enrich conversation. Our theme for this month is “Honesty/Integrity,” and each day for our SWOW the student looked at a different perspective on the subject. On Monday, the students discussed “The Lies Satan Tells Us.” In our faith, we believe that Satan is the origin of lies, and often is our deceiver and tempter. Students Andrea Navarro and Andrew Kiener spoke about this subject. On Wednesday, Katrina Threatt kicked off the day by discussing “The Lies we Tell Others.”She talked about the different masks we wear around people. In the evening, Madeline Freimark O’Flaherty and Sipho Mzizi spoke. They both shared their thoughts about how lying hurts our relationship with others, and how in the end lying hurts us. Then on Thursday, students covered “The Lies We Live.” This day, Lemti Nyirendah, Hazel Romero, and Levis Waiyaki shared their thoughts. They had a wide range of ways of looking at this topic. They discussed things like procrastination, back-stabbing, and being a hypocrite as all ways we live our our lives. On Friday, one student speaker, Henni Lee, sharing her thoughts on “The Way, the Truth, and the Life.” She talked about how through Jesus the truth is revealed, and how Jesus shows us who we really are. Finally, on Sabbath, we had our Religious Vice Presidents, Jesse Zachawerus and Eliasib Sandoval, share their take on “Integrity.” Also, senior Rylan Chamberlain recited a poem he wrote about “Honesty,” and was a lovely recap on what each of this classmates shared that week. Like I said at the beginning, I am incredibly proud of each of our students. Behind the scenes, each student worked hard trying to piece together a talk that flowed well and was something meaningful to share with the student body. Prior to SWOW, myself or another leader on our team would sit down with the speakers one on one, and pick their brains about the topics they had. With the students that I sat down with, we worked hard to create a flow for their talks that was cohesive. In those moments chatting with those students, I had some thoughtful and vulnerable conversations with the students that helped their heart shine through in their talks. Later, I helped conduct three preaching workshops to help the student learn how to piece together a sermon, some different techniques to use while speaking, how to calm nerves, etc. We also had practicing sessions where I had some students do their talks in front of their peers. After the students practiced, we would give them feedback and critiques on how they can improve. I just want to say, the growth that I saw in some of our students was beautiful. Both the students who felt already comfortable on stage and those who have never held a microphone, took their talks to the next level. From the moment we had our first sit-down conversation about the topic to the day they went up to speak, they pushed themselves out of their comfort zone and really shined. I think for some of these students, they did something they never thought the could. Friday night, we ended the evening with a prayer circle with some students and staff that wanted to pray together. We did a “popcorn prayer” where we let anyone who liked to lead out in prayer, one after the other. By the end of that prayer session, I was so moved by the words our students shared to God about how that week impacted them, and the reflection about the week. I was brought to tears. I felt so proud of the hard work that the students put in, and I was grateful for the impact it seemed to have on some of the students and staff. It’s moments like those that remind me how amazing it is to work with young people and how much I love my job. We have some pretty awesome students who are working hard to serve the Lord. In my heart, I truly believe that God is working on our campus, and the students our the vessels for that marvelous work.